Wandered out to Tourist Camp last night after dinner with Kyle. There are many different kinds of “tourists” down here, but those who stay overnight camp out at a designated smoothed area, about a 10 minute walk from station. 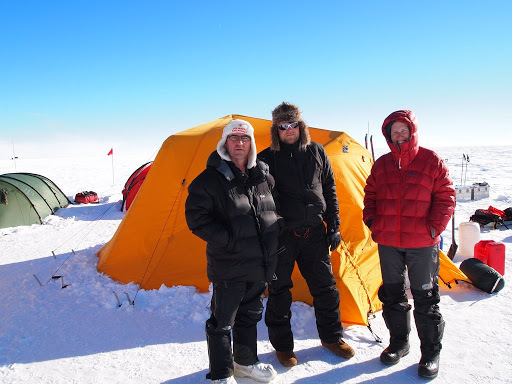 Looking out from the comfort of the galley window, you can see their nylon tents and vehicles clustered north of the skiway with nothing but a thousand miles of Antarctic plateau behind them – a reminder of what things used to be like down here. There’s a complex slew of agreements between the USAP and various tour agencies, but the general pattern is this: except for tours pre-arranged with station management, the tourists aren’t allowed on station at all. Not to buy stuff from the store, and not to use the bathrooms. It’s by mutual agreement, even if it does seem a bit harsh. But frequently the tour groups, especially those who are staying more than a couple of days, will make it known that Station folks are welcome to come out and visit. 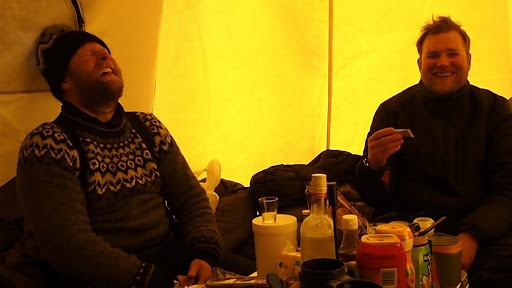 We’ve got a few such groups camped out there right now – Austrian skier Hermann Maier and friends, and the support team for “Extreme World Races” among them. One of the Icelandic drivers for EWR extended a blanket invitation to Kyle, so we wandered out together to pay a housecall. 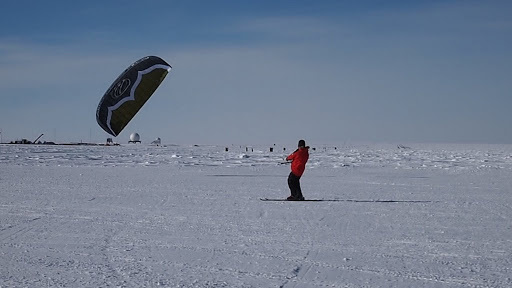 Maier and friends were playing around with some kite-skiing gear when we arrived. He insisted that it was a piece of cake to learn. I opined that perhaps his skiing experience contributed to that impression. When I turned, I noticed that Kyle had disappeared. A few moments later, a head in a fur hat poked out of one of the tents, waved me over with a vaguely conspiratorial look, and disappeared back inside. 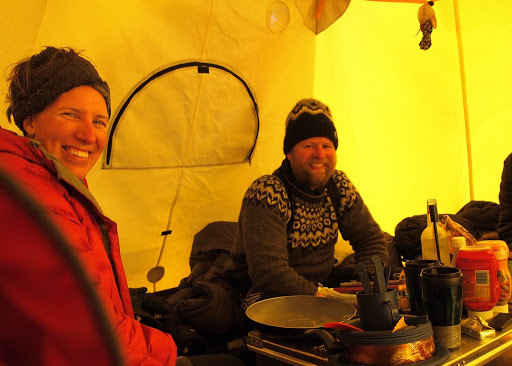 I ducked my head in and found Kyle sitting with Gisli, Gummi and Felicity on benches around a campstove and veritable smorgasbord of snackables. They gestured me to join them and handed me a shot glass of vodka to join them in a toast the moment I’d planted my posterior. Anyhow – eventually it was time to go. 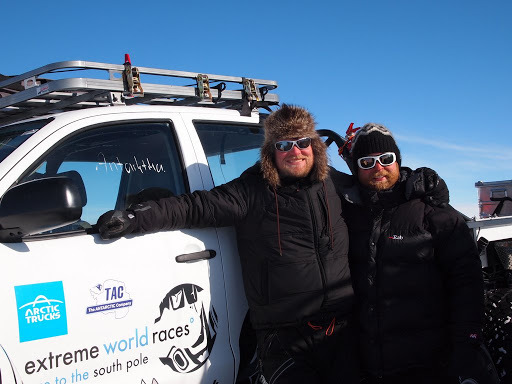 Gisli insisted on giving us a ride back in one of the team’s 6×6, rolling down the end of the skiway and pulling up in front of the ceremonial pole to drop us off. They’ve invited the entire station (all 240 of us!) out to their camp for New Years (the station proper will celebrate it tomorrow night, on the 1st). It feels a little awkward, us all descending on them and officially prohibited from bringing any sort of station-acquired gifts (like food or alcohol bought here). But I’m sure everyone will find an appropriate way to contribute. 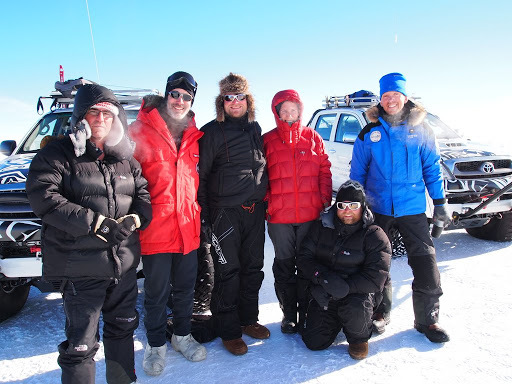 Pablo, who would have guessed that the most interesting part of being at the Pole is the tourists? Am loving your descriptions…thanks for posting and Happy New Year from "up here" to "down there".